In this paper, we made a survey on the prediction capability of bibliometric indices and alternative metrics on the future success of articles by establishing a machine learning framework. Twenty-three bibliometric and alternative indices were collected to establish the feature space for the predication task. In order to eliminate the possible redundancy in feature space, three feature selection techniques of Relief-F, principal component analysis and entropy weighted method were used to rank the features according to their contribution to the original data set. Combining the fractal dimension of the data set, the intrinsic features which can better represent the original feature space were extracted. Three classifiers of Naïve Bayes, KNN and random forest were performed to detect the classification performance of these features. Experimental results show that both bibliometric indices and alternative metrics are beneficial to articles’ growth. Early citation features, early Web usage statistics, as well as the reputation of the first author are the most valuable indicators in making an article more influential in the future. The online version of this article ( https://doi.org/10.1007/s11192-019-03052-9) contains supplementary material, which is available to authorized users. This work was supported by the National Natural Science Foundation of China (Grant No. 71473034), the financial assistance from Postdoctoral Scientific Research Developmental Fund of Heilongjiang Province (Grant No. LBH-Q16003), and the national undergraduate training programs for innovation (Grant No. 201510225167). Priem, J., & Hemminger, B. M. (2010). 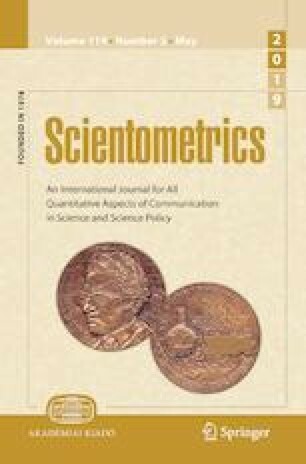 Scientometrics 2.0: Toward new metrics of scholarly impact on the social Web. First Monday, 15(7). Retrieved from https://journals.uic.edu/ojs/index.php/fm/article/view/2874/2570. Priem, J., Parra, C., Piwowar, H., Groth, P., & Waagmeester, A. (2012). Uncovering impacts: a case study in using altmetrics tools. In Second international conference on the future of scholarly communication and scientific publishing. Heraklion, Greece. http://jasonpriem.org/self-archived/altmetrics/sepublica/cameraready.pdf. Accessed 19 Mar 2013.